A substantial almost-meaty green salsa made with a mix of roasted cactus pads (called nopales), tomatillos and jalapeño. Low Carb. Weight Watchers Friendly. Not just vegan, Vegan Done Real. Naturally Gluten Free. Whole30 Friendly. WAY BACK IN 2005 Whole Foods is a hike so I don't go often. But on a recent stop, I was surprised that the produce section offered nothing unusual. Sure, the vegetables are displayed like couture. Sure, the range of organic vegetables is spectacular. But as for something new, something unusual ... ... ... nada. In contrast, both my favorite grocery stops (for St Louisans, that would be Schnucks in Kirkwood and Dierbergs in Rock Hill) nearly always have something that I've never before even noticed let alone cooked. Today it was a package of nopales (also known as prickly pear cactus) from Melissa's – for all of $2, the spines removed. I grabbed 'em, even though I had no idea what to make with nopales! Luckily, the recipe inspiration came easily, an adaptation of a straight-forward tomatillo salsa. But after making this salsa with both nopales and tomatillos, I had to figure out how to use it! 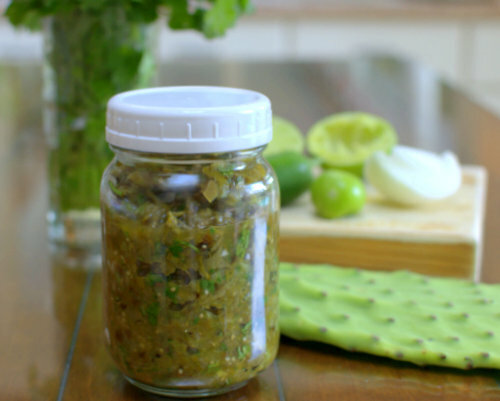 Again luckily, it's super-easy to use this nopales-tomatillo salsa. Here's what I've done so far, just working the salsa onto our plates using the simple ways we eat every day. WORD DANCERS! Help me out here, please? From what I can tell, the word nopal is the singular form used for a single prickly pear cactus pad (also called a cactus leaf) while the word nopales is the plural form for many cactus pads (also called cactus leaves). The word on the Melissa's package, nopalitos, is the word for sliced or diced cactus leaves and also the word for the salad made from sliced or diced cactus leaves. Nopal vs nopales vs nopalitos, it all makes sense now, right?! BROILER Preheat the broiler, placing a rack right below the heat source. In separate areas on a baking sheet lined with foil or parchment, arrange the tomatillos, nopales, jalapeno and garlic with as much space between as possible (this way, the vegetables roast instead of steam). Broil for up to 30 minutes, checking every 10 minutes. The tomatillos, especially if they're small, may need to come off after 10 minutes, they should be soft but not melted. The nopales will puff up and get soft. FOOD PROCESSOR First, chop the onion and salt together until fine. Add the remaining ingredients and process just until combined, you want quite a lot of texture to remain. Taste and adjust the seasoning: more salt? more cumin? more lemon juice? more fresh tomatillo? VARIATIONS Switch the proportions, more tomatillos than nopales. If you like, roast the onion too, I'd cut it in thick slices, cut cross-ways. Grilling would work beautifully too and would add a lovely smoky essence. CACTUS SPINES! Yikes, even when the sharp spines (cactus spines are also some times called cactus thorns) are removed, there are still tiny bits of spine embedded in the flesh. I made the mistake of running my hands across the pads to find them. Don't do this! For days, my hands held small, quite uncomfortable spikes. Just use your eyes to find the spines and remove the spines with small needle-nosed pliers. NUTRITION INFORMATION Per 1/4 cup: 36 Calories; 0g Tot Fat; 0g Sat Fat; 0mg Cholesterol; 210mg Sodium; 7g Carb; 3g Fiber; 3g Sugar; 2g Protein. WEIGHT WATCHERS WW Old Points 0, WW PointsPlus 1, WW SmartPoints 1, WW Freestyle 0 CALORIE COUNTERS 100-calorie serving = scant 3/4 cup (5g) protein. TODAY'S VEGETABLE RECIPE INSPIRATION Adapted from Gourmet November 1999. ~ Vegetables 101: What Is a Tomatillo?